For eight nights near or during the beginning of winter, Jews the world over gather and light the chanukiyah, more commonly known as the Hanukkah menorah, to fulfill the commandment of the public display of the miracle of Hanukkah. There are many different ways to light the chanukiyah. The chanukiyah (ha-new-key-uh) is better known among English speakers as a Hanukkah menorah. The term "chanukiyah" is a modern Hebrew word that was coined in the late 19th century when the new incarnation of the ancient tongue was birthed. The word specifically denotes the nine-branched candelabra used at Hannukah time. The word "menorah" simply means "lamp" in modern Hebrew. In modern Hebrew, the word "menorah" also refers specifically to the seven-branched candelabra used in the ancient temple, which is today a more general symbol of Judaism. Before the advent of modern Hebrew, Jews referred more often to lighting the Hannukah lights or to the candelabra as a menorah. 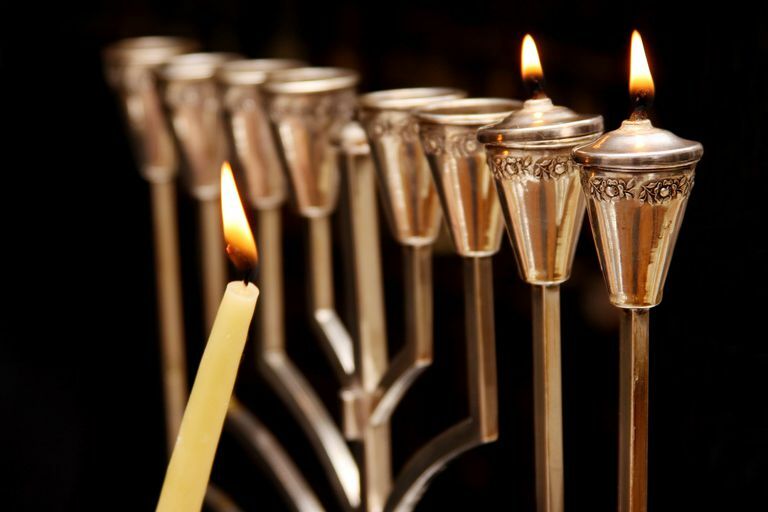 English speakers still most commonly say the word "menorah" to refer to the candelabra used at Hannukah time. This article uses the word "chanukiyah" for its specificity and also because it is gaining currency in English. The chanukiyah has eight places for lighting with a set-apart ninth spot for the shamash ("helper" or "servant")—the light used to light the other branches. On each night of Hanukkah, the shamash is lit first, and then the others, whether oil or candles are lit one by one. The chanukiyah is the symbol that represents the miracle of Hanukkah (חנוכה). In the second century BCE, during the rededication of the Temple in Jerusalem, the one-day supply of oil that lit the Temple menorah lasted a miraculous eight nights instead of just one. The story of Hanukkah is recorded in the books of 1 and 2 Maccabees, which are not part of the Jewish canon, making this festival a unique holiday in the Jewish calendar and one of the first "modern" holidays to enter the cycle of holidays. On one side of an ancient debate, all eight lights were kindled on the first night and were reduced one at a time each day of the festival. Today it is standard to start with one and work up to eight, as the other ancient school of thought suggested. In some households, a chanukiyah is lit for every member of the family, while in others a single one is fine for everyone in the household to fulfill the mitzvah (commandment). Some use candles exclusively while others prefer to use oil, in order to be as authentic to the original commemoration as possible. The Chabad Hasidic sect, further, uses a beeswax candle for the shamash. The debate on starting the holiday with eight candles versus one comes from the Talmud (Tractate Shabbat 21b) in a classic Beit Hillel and Beit Shammai debate. Beit Shammai held that all eight lights are kindled on the first night, while Beit Hillel said to work up to eight, day by day. "Ulla said: In the West [the Land of Israel]...R. Jose b. Abin and R. Jose b. Zebida differ concerning this: one maintains, the reasoning of Beit Shammai is that it should correspond to the days still to come, and that of Beit Hillel is that it shall correspond to the days that are gone. But another maintains: Beit Shammai's reason is that it shall correspond to the bullocks of the Festival [of Sukkot], while Beit Hillel's reason is that we increase in matters of sanctity but do not reduce." First, of course, you'll need a chanukiyah. They come in all shapes and sizes, with some using candles and others using oil. There are designer ones and simple ones, travel size and those that sit on the lawn overlooking the White House. Just make sure there are nine branches for your chanukiyah; that the eight candle holders are in a line, and not a circle; and that the space for the shamash is set apart from or misaligned with the eight other candle holders. Gather your other supplies: matches and candles or oil. Some people also place a mat underneath their chanukiyah to prevent wax and oil from spilling and staining furniture or window sills. Place your chanukiyah in the line of public sight. Many people place theirs in the front window of their home, on their porch, or in Israel, in a box outside the home. Fill the unlit oil or place the unlit candles in the chanukiyah as you face it from right to left, and be prepared to light them from left to right. Light the shamash and, while holding this candle, say the blessings (see below). Finally, after the blessings, light the candle or oil, from left to right, and place the shamash in its designated spot. Blessed are You, O Lord Our God, Ruler of the Universe, Who has sanctified us with Your commandments and commanded us to kindle the lights of Hanukkah. Blessed are You, O Lord Our God, Ruler of the Universe, Who has kept us alive, sustained us, and brought us to this season. Repeat this process every night of Hanukkah, remembering to leave out the Shehecheyanu blessing on the evenings after the first night. Then enjoy latkes, sufganiyot, Hannukah songs, and games of dreidel. The Jewish Channel's instructional video gives a clear demonstration of the blessings as well as the placement and technique of lighting the chanukiyah.